As professionals in our data-driven economy, our methodological tool sets and applications continue to expand and to evolve and we continue to create new synergies through collaborations and partnerships. I was recently invited to keynote the 2011 PAKDD Knowledge Discovery and Data Mining Conference in Shenzhen, China, which took place, May 24-27, 2011. At first, I responded that I do not do research in data mining, but when the organizers persisted and said that the audience can learn from me, I agreed. I also thought that it would be a great forum in which to discuss some of the research that my group was involved in. After I provided a list of possible topics, the organizers selected: Supernetworks: Opportunities and Challenges for Decision-Making in the 21st Century, and it can be accessed and viewed here. This experience further reinforced the importance of learning from one another, as noted by the PAKDD conference organizers, and, indeed, one of the most effective means in stimulating interest in a topic (and learning) is through speakers and their talks. For example, at UMass Amherst, through our INFORMS Student Chapter, we have hosted numerous speakers from academia, industry, and government, and across disciplines, who have spoken on timely topics, all with an analytics theme. Computer Scientists march across our campus to attend, even in the winter, and folks have traveled from Vermont, Boston, and even New Jersey to hear our speakers. At times, we have been overwhelmed by the attention, especially when news and TV crews show up. 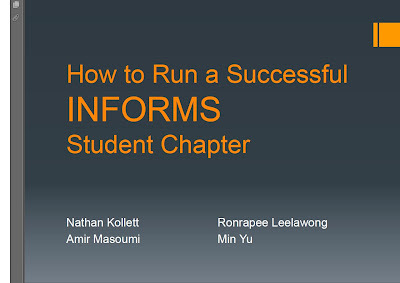 Now, I have the honor of chairing the INFORMS Speakers Program, with Dr. Tim Lowe and Dr. Les Servi assisting me. An article on this program that also highlights some of the new initiatives should be appearing in the next issue of Analytics. By learning from one another and doing the best work possible is how we will move Analytics and Operations Research forward and have a great time, as well! The 2011 IEEE Conference on Supernetworks and System Management has now come to an end. It took place in Shanghai, China, May 29-30, 2011. Keynote speakers included Professors June Dong, Hani Mahmassani, and Harry Timmermans. My doctoral student, Min Yu, who is from China, delivered my keynote that I prepared, entitled: Supernetworks in Healthcare and Humanitarian Operations. Professor June Dong spoke on Disruptions in Supply Chain Supernetworks and Professor Timmermans on Applications of Supernetworks in Modeling Activity-Travel Behavior. Several other presentations that were prepared by Center Associates of the Virtual Center for Supernetworks can be found here. Above are photos from the conference, courtesy of Professor June Dong. 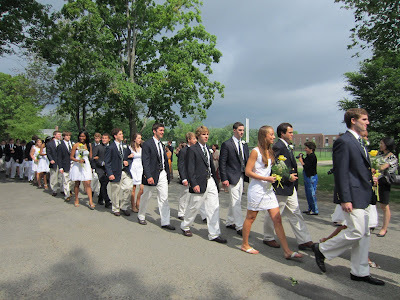 Today, May 29, 2011, the Deerfield Academy graduation took place in historic Old Deerfield on a day that began with clouds and then turned into a glorious one! 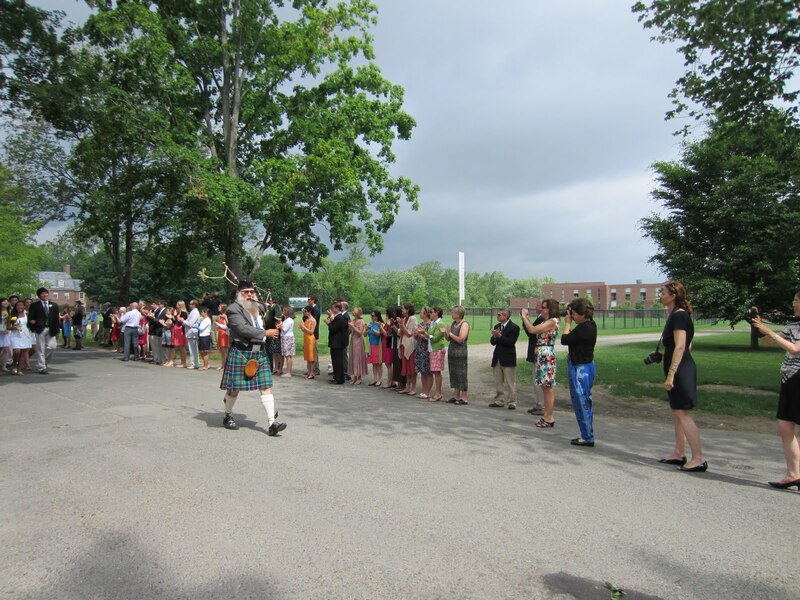 The event, complete with bagpiper, a drum corps, the graduating seniors, the other students, the faculty, members of the Board of Trustees, special guests, and families and friends, was simply spectacular. The above photos capture some of the majesty of this special day. 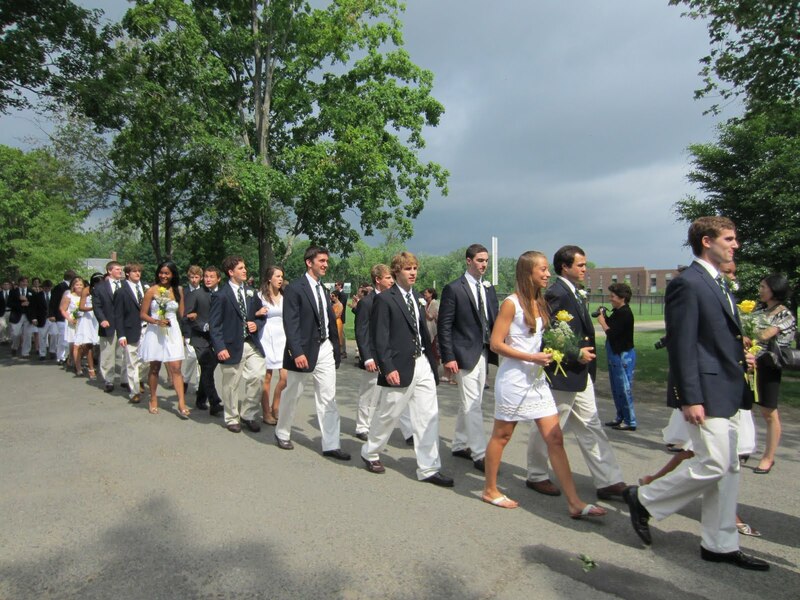 Congratulations to the Deerfield Academy class of 2011! Last night, I finished reading the classic book, Death Be Not Proud, by John Gunther, which was published in 1949. Gunther, himself a Deerfield Academy graduate, in this deeply touching memoir, recounts his son's struggles with a brain tumor and his ultimate death at the age of 17. One of the highlights of Johnny's 15 month struggles with a tumor known as a glioma, which he endured through multiple brain surgeries, X-ray treatments, mustard gas infusions, and a diet with no protein and fats (remember this was the late 1940s), and made the most of each and every day, was that he was able to march in his Deerfield Academy graduation. Although he had been away from school for 14 months, as top doctors somehow kept him alive, along with his unrelenting spirit and joy in living plus the love and care of his parents, he had completed enough of his coursework, independently and through the help of tutors, to graduate. 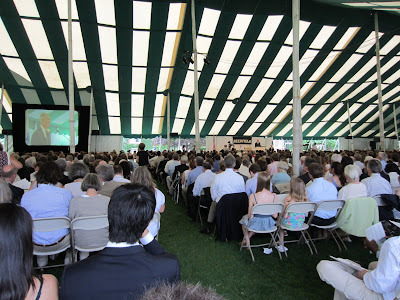 Tomorrow is graduation day at Deerfield Academy (DA), which I am very much looking forward to since my daughter is a student there and she has quite a few friends among the seniors who will be graduating. Slowly, very slowly, Johnny stepped out of the mass of his fellows and trod by us carefully keeping in the exact center of the long aisle, looking neither to the left nor the right, but straight ahead, fixedly, with the white bandage flashing in the light through the high windows, his chin up, carefully, not faltering, steady, but slowly, so very slowly. The applause began and then rose and the applause became a storm, as every single person in that old church became whipped up, tight and tense, to see if he would make it. The applause became a thunder, it rose and soared and banged, when Johnny finally reached the pulpit. Mr. Flynt carefully tried to put the diploma in his right hand, as planned. Firmly Johnny took it from right hand to left, as was proper, and while the whole audience rocked now with release from tension, and was still wildly, thunderously applauding, he passed around his place among his friends. Johnny lived his life to the fullest and his love of life and learning (especially of chemistry, math, and physics -- he had written a letter to Einstein, who had written back) affected all those around him. 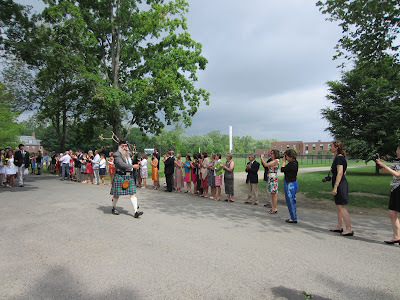 Last year, I posted some photos from the graduation, complete with a bagpiper, which was stunning, and which you can view here. My husband read the book while a student and now, amazingly, not only is our daughter at DA, but she went to the Bement School with the great-granddaughter of the Mr. Flynt noted above and although we never met Mr. Frank Boyden, the headmaster of DA for over 50 years, who helped Johnny Gunther, my neighbor in Amherst and colleague, Professor Emeritus Jack Conlon, knew him well. Research that years after publication is still being cited and that gets discovered by different disciplines is research that needs to be celebrated and those behind it recognized. Solid theoretical research, which is implemented in practice, deserves special kudos. I was incredibly lucky to have had my doctoral dissertation committee at Brown University consist of Professor Stella Dafermos, as the chair, with Professors Martin Beckmann and George Majda. Both Dafermos and Majda died much too young but left amazing scholarly legacies and impacted many students. Professor Martin Beckmann, the renowned economist and regional scientist, is still with us and his classic book, with McGuire and Winsten, Studies in the Economics of Transportation (1956), continues to inspire both research and practice. A quote from the Beckmann, McGuire, and Winsten book appears in the first chapter of William Sandholm's recent book, Population Games and Evolutionary Dynamics, MIT Press. Beckmann's work has stimulated such areas of research as congestion games, evolutionary dynamics, and the development of analytical methodologies from variational inequalities to projected dynamical systems. His research on the rigorous formulation of user-optimized behavior in congested urban transportation networks is applied around the globe. You can read more about the impact of the Beckmann, McGuire, and Winsten book, Studies in the Economics of Transportation, in a retrospective paper that I wrote with David E. Boyce and Hani S. Mahmassani. Last year, Professor Mahmassani organized the Transportation Network Design and Economics Symposium at Northwestern University in honor of Professor Beckmann and you can view the video of his lecture, my lecture on supply chain network design under oligopolistic competition, and Professor Boyce's fascinating lecture on the history of transportation highway design in Chicago here. The PAKDD 2011 Conference begins today in Shenzhen, China. My keynote talk, prepared for this conference, is: Supernetworks: Opportunities and Challenges for Decision-Making in the 21st Century. In the presentation, I emphasize the importance of capturing the complex behavior of decision-makers on networks today, in an era of congestion and nonlinearities, from multimodal transportation and multitiered supply chains to electric power generation and distribution networks to financial networks and the Internet. The lecture discusses the reality of networks today from their large-scale nature, to network interactions. I illustrate the Braess paradox, both in static and time-varying forms, as well as the wisdom of crowds phenomenon. I also highlight how we capture network efficiency / performance and identify which nodes and links really matter in that their destruction has the biggest impact. The lecture addresses issues of network design, through appropriate link addition/deletion, the integration of networks as in mergers and acquisitions, the evolution of social networks with supply chains and financial networks, as well as the challenges faced in humanitarian operations in disasters and the potential of identifying synergies through cooperation/collaboration. The audio/video of my keynote can be downloaded here. A rich media version was also generated. The pdf of the presentation slides only can be accessed here. This keynote will be delivered virtually. Christine Lagarde, who is favored to be the new head of the International Monetary Fund (IMF), was to be in Amherst this weekend to receive an honorary degree from Amherst College, but had to cancel. This is clearly a disappointment, but as the Minister of Finance and Industry in France, she has to be available after the scandal preceding the arrest and resignation of the former head of the IMF, known as "DSK," who was expected to run for the presidency of France. Kudos to Amherst College for having the foresight to award her an honorary degree and to invite her to Amherst, which I have called the center of the universe. The New York Times is very positive on Lagarde and she will make history/herstory should she become the first female leader of the IMF! Attaining the rank of Full Professor in academia is quite the achievement and, typically, to reach this rank, one, after receiving a PhD, becomes an Assistant Professor, then gets promoted with tenure (if all goes well) to Associate Professor, and, after a few more years (and, hopefully, no politics to interfere), attains the rank of Full Professor. There are also chaired/named professorships, which are honorific-type of appointments that usually come with expanded resources and are, most often, given to Full Professors that merit special recognition. As a named professor, who has graduated 15 PhD students, I follow the careers of my former students closely and am thrilled by their professional successes. One of my former doctoral students, Tina Wakolbinger, who received her PhD from UMass Amherst in 2007, with a concentration in Management Science, and who was until recently an Assistant Professor at the Fogelman College of Economics and Business at the University of Memphis, has, as of May 15, assumed her new faculty appointment. Dr. Wakolbinger is now a Full Professor of Supply Chain Services and Networks at the Institute for Transport and Logistics Management at the Vienna University of Economics and Business in Vienna, Austria! She began teaching a course on Global Supply Chain Management there in English this past week. Tina, along with Professor Dietrich Braess, and me, translated the famous Braess (1968) article, which included the paradox named after him, from German to English. Together, we also wrote several research articles that have appeared in such journals as Naval Research Logistics and Computational Economics. Her doctoral dissertation title was: A Dynamic Theory for the Integration of Social and Economic Networks with Application to Supply Chain and Financial Networks. To achieve the rank of Full Professor in only a few years after attaining a PhD is quite the achievement and to get such a position in one of the most glorious cities in the world and in the largest public business university in Europe deserves accolades! Dr. Wakolbinger actually received the offer last summer shortly after we were at the Computational Management Science conference in Vienna. For more information on Dr. Wakolbinger's dissertation, and that of my other students, click here. The official announcement of her Professorship is here. Congratulations to another female Full Professor! I continue to be fascinated by networks in nature and have been conducting research at the interfaces of economics, ecology, and operations research. Specifically, I became intrigued by the underlying economics of predator-prey relationships in complex food webs, which are nature's supply chains. This research has led to the paper, "Spatial Price Equilibrium and Food Webs: The Economics of Predator-Prey Networks," in which we establish that the governing equilibrium conditions underlying predator-prey interactions with multiple species correspond to the classical spatial price equilibrium conditions dating to the work of the Nobel Laureate in Economic Sciences, Paul Samuelson! To be able to establish the equivalence between systems in ecology and in economics, as we have done, suggests an inherent commonality among entirely distinct network systems and demonstrates that interactions in ecology and biology can be interpreted economically with price functions and transportation / transaction cost functions. Another fascinating aspect of ecological networks and food webs is that nodes correspond to different species but the flows are common and correspond to biomass flows. So, such networks are single commodity ones! 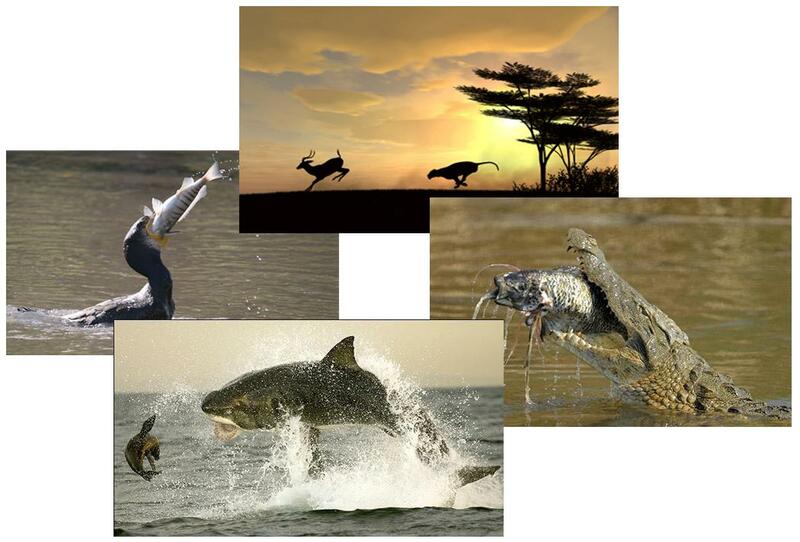 Our research included the development of a dynamic model of predator-prey interactions using projected dynamical systems theory, a theory and methodology which we developed, and which is now being used in evolutionary game theory by, among others, Bill Sandholm. I just purchased his book and am enjoying reading it. Economists (and others) are fascinated by evolutionary game theory, which has origins in biology, notably, in the work of Maynard Smith. I am delighted that our work has relevance here, as well. Our paper is to appear in the Proceedings of the 2011 IEEE Conference on Supernetworks and System Management. This conference takes place in Shanghai next week. The 2011 World Science Festival (WSF) begins June 1 in NYC and runs through June 5. It will consist of 50 different events over 5 days and, should be as fabulous as previous WSFs! Although I would have liked to have seen more female mathematicians and scientists in this year's lineup there is a "Spotlight: Women in Science," which includes another former Radcliffe Institute for Advanced Study Science Fellow, Dr. Priyamvada Natarajan, a physicist at Yale. She was at Radcliffe in 2008-2009. I was also a Radcliffe Fellow, in 2005-2006, and had the honor and great fun of taking part in the WSF in 2009 as part of the Traffic panel. You can read some of my reflections and view a video from this event here. Dr. Brian Greene and his wife, Tracy Day, are the brains and innovators behind this fabulous festival. If you get a chance to attend at least one event, I am sure that you will certainly long remember it! Now that the academic year has come to a close with celebratory graduations and associated events in the past, I have begun to pack for my trip to China later this week. I will be giving two keynote talks at conferences, at the 2011 PAKDD conference in Shenzen, and at the 2011 IEEE Conference on Supernetworks and System Management in Shanghai. At the PAKDD 2011 conference, I will speak on "Supernetworks: Opportunities and challenges for decision-making in the 21st century," and at the IEEE conference, I will speak on "Supernetworks in healthcare and humanitarian operations." Joining me at the latter conference will be a former doctoral student of mine, Professor June Dong of the School of Business at SUNY Oswego, who is helping with the organization of that conference, and a present doctoral student of mine, Min Yu, who will present our paper, Sustainable Fashion Supply Chain Management Under Oligopolistic Competition and Brand Differentiation, to appear in the International Journal of Production Economics, Special Issue on Green Manufacturing and Distribution in the Fashion and Apparel Industries. Our conference presentation can be downloaded here. In addition to my keynote in Shanghai, I will deliver the paper, "Spatial price equilibrium and food webs: The economics of predator-prey networks," which was co-authored with my husband, Professor Ladimer Nagurney. This paper will appear in the conference proceedings and the presentation I have made available because it should be of interest to not only the ecology community but also to economists and operations researchers. For those who think that once the teaching is over, faculty just go on vacation, I beg to differ. 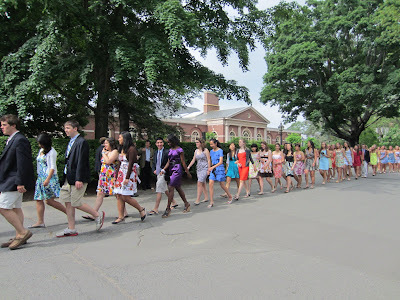 Now that graduations are over with and before another set of conferences begins, one can reflect on the academic year that has passed. At times I wish that the ivory tower was, indeed, ivory to reflect an integrity that one expects of academics. However, I continue to observe that, at various colleges and universities, it is increasingly not those who have worked the hardest and the most diligently that get the promotions and rewards, but, rather, it is those with the right "political" networks. I am seeing more administrative appointments without searches; deserving faculty, whose promotions are delayed or stymied or outrightly denied because of egregious falsehoods, disregard to policy manuals, and errors that propagate up the chain of decision-making, and a deemphasis of diversity and equal opportunity. I know of a teaching award winning faculty member, who is also a member of a minority, who was told to postpone his promotion and tenure decision year so that others could go through the process before him. I am seeing more searches in which the finalists have no female representation even in areas in which females are well-represented. I am witnessing rude public firings of directors by other administrators for no reason than to include substitutes that match more closely the one who did the firing. I am seeing academic positions that are getting filled not by the best as according to the job description but by friends of those in so-called leadership positions. I know of a female faculty member whose required course was made unrequired midyear and program graduation requirements altered to suit recently hired faculty with students not even being informed. It appears that, in cases, it is the case that higher-level administrators are tacitly approving the misbehaviors and bullying of others by the lower level administrators. 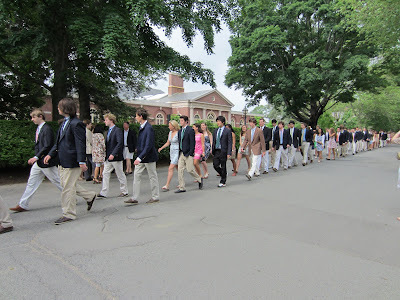 As a colleague of mine told me recently at one of our graduation ceremonies, and I concurred, individuals know the paths that they have taken to reach their destinations/positions and they have to live with the choices made. I sometimes feel that some may just lack a conscience. It takes a leader with courage to right the wrongs and I wonder where are the administrators who are up to this task?! Sometimes too much delegation without proper oversight and communications can completely destabilize what a school or college has taken years to build. Now is the season of college graduations and a time to celebrate the accomplishments of our graduates! The past two days UMass Amherst has been holding its graduations with the undergrad and grad ones taking place yesterday and many of the college and school ones today. The Isenberg School held its graduation ceremony at the Mullins Center today and it was quite the special event. 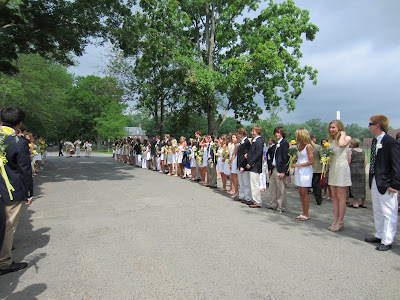 Above are some photos of the graduates, faculty, and families. 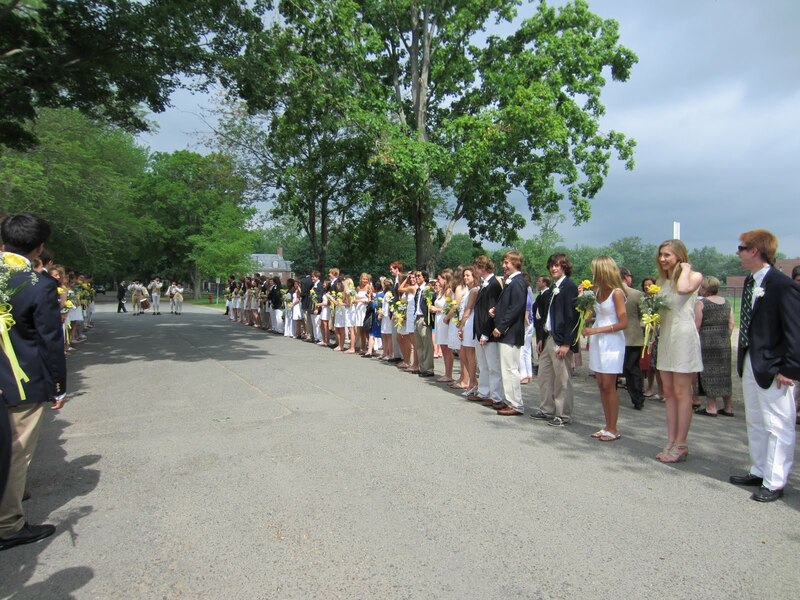 Special thanks to the families of the graduates and congratulations to the class of 2011! If you'd like to learn more about what makes UMass Amherst great, please view this video. Some alums brought it to my attention and it was a pleasure to be featured along with such colleagues as Professor Robert Pollin, Kevin Fu, Susan Leschine, and even Sheila Bair, who is stepping down as Chair of the FDIC as of July 1, 2011, and, perhaps, will return to the Isenberg School. Our Chancellor, Dr. Robert Holub, does a great job in the video of extolling the virtues of the research, education, and community at UMass Amherst. According to The New York Times, there is a shortage of graduates with math skills, who can analyze the massive amounts of data that are now available for businesses (and other organizations). Economists are saying that we are entering a new era, similar to the Industrial Revolution, in which the access to huge volumes of data can spur innovation, new products, and new business models. McKinsey & Company issued a new report, Big Data: The Next Frontier for Innovation, Competition, and Productivity, which bodes well for those of us who, as business professors, teach the quantitative subjects, such as operations research / management science, as well as for our students. Clearly statistics and experimental design and data mining are essential for filtering out the data streams but, as important, is knowing what to do with the data and how to optimize our business (and other) processes accordingly. We can't just sit and analyze the past but need to work on managing the world's resources for a safer, more secure, and sustainable future. Math matters and, besides, not only is it so much fun but doing and applying math is also rewarding and useful! Perhaps the US will finally wake up and realize how essential math education is to the present and the future of our country and its very competitiveness. 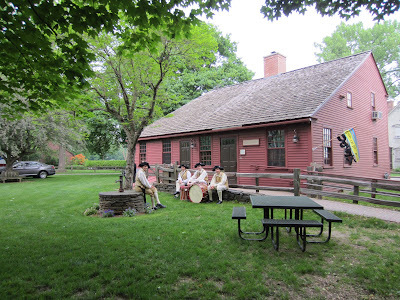 How well I remember 6 years ago when I received the phone call that I had received a Science Fellowship from the Radcliffe Institute for Advanced Study and could spend a full sabbatical year at Harvard! It was a fabulous year during which I wrote my Supply Chain Network Economics book plus several research papers and an essay reflecting on that very special year. Most importantly, I relished the time that I had to pursue new collaborations, to work on dynamic networks, and to make new friendships with the other Radcliffe Fellows who represented so many different disciplines. We like to say that we were the best group of Fellows (but probably every class of Radcliffe Fellows thinks the same)! 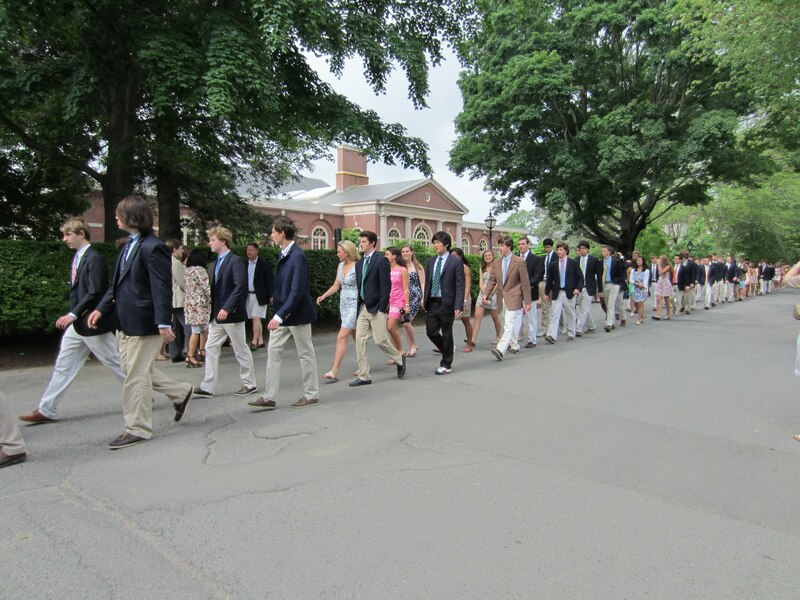 The 2011-2012 Radcliffe Fellows have now been announced and only 6% of the applicants were successful. That is close to the success rate of my year, as well. The full list of new Fellows can be found on the Radcliffe Institute website. I'd like to congratulate the new Fellows and to wish them much success on their projects! I'd like to also take this opportunity to thank Dean Barbara Grosz, who is stepping down as the Radcliffe Dean. She was the Science Dean of Radcliffe my fellowship year and assumed the position of Dean, when the then Dean, Dr. Drew Gilpin Faust, became the President of Harvard, following Dr. Larry Summers. It was quite the year to be at Harvard. Dr. Barbara Grosz will be taking a sabbatical at Stanford and will then return to the faculty of the School of Engineering and Applied Sciences (SEAS) at Harvard. I wish her all the best! Her ten your service to Radcliffe was extraordinary! She is a role model, top scholar, superb administrator, and wonderful colleague and is one of the first female computer scientists, so she is a trailblazer. Professor Lizabeth Cohen has been named the Interim Dean of Radcliffe and assumes her new role on July 1, 2011. Resilient companies are surviving by continuing to dynamically adapt to the supply chain disruptions and cascading failures post the triple Japan disaster that occurred on March 11, 2011. To get the parts that are essential for their production processes they have been working even with the suppliers of their suppliers going upstream into the complex supply chain networks. The New York Times is reporting, in a fascinating article, how General Motor's crisis management team, with white knuckles, resolved the crisis situation. GM, which spends about 2 percent of its parts-buying budget in Japan, identified 118 products that it needed to monitor for shortages but has resolved problems with all but five. The company’s chief executive, Daniel F. Akerson, predicted last week that the Japanese disruptions would have no material impact on G.M.’s earnings. This is in stark contrast to Toyota, which is experiencing shortages of about 150 parts, for its North American plants, since it uses about 15% of its components from Japan. GM was able to find alternative suppliers and to assist others in going online, even working back across multiple tiers of its supply chain, something that it had never, previously, had to do. However, there is still a chance of a shortfall in semiconductors and other electronics needed for autos and this situation is being closely monitored. Clearly, companies must view and manage their supply chain networks as systems in their full complexities. One should move beyond the white board with green and red stickers for product and time management. It looks as though GM will regain its place as the world's biggest auto company. Our research on supply chain disruptions is relevant in this scenario. Our paper, Modeling of Supply Chain Risk Under Disruptions with Performance Measurement and Robustness Analysis, by Professors Qiang Qiang, Anna Nagurney, and June Dong, appeared in Managing Supply Chain Risk and Vulnerability: Tools and Methods for Supply Chain Decision Makers, T. Wu and J. Blackhurst, Editors, Springer, Berlin, Germany (2009) pp 91-111. That was the theme discussed by student panelists at our recent INFORMS Conference that took place at UMass Amherst, May 6-7, 2011. The tips provided by the panelists, all of whom have served as officers of the UMass Amherst INFORMS Student Chapter, were very valuable. This student chapter has garnered 4 national awards for its activities in the past several years. The panelists discussed the history of the chapter, how to ensure the sustainability of the chapter through funding sources for its activities, the importance of solid leadership by its officers and Faculty Advisor, how to identify (and execute) interesting activities and events, both social (from bowling and ping pong tournaments to regular end of semester parties) and academic (such as our Speaker Series and field trips to companies) that attract a good audience. They noted the importance of regular communications about chapter activities and the use of social media for communications, from Facebook to Twitter, in addition to its regularly updated website. 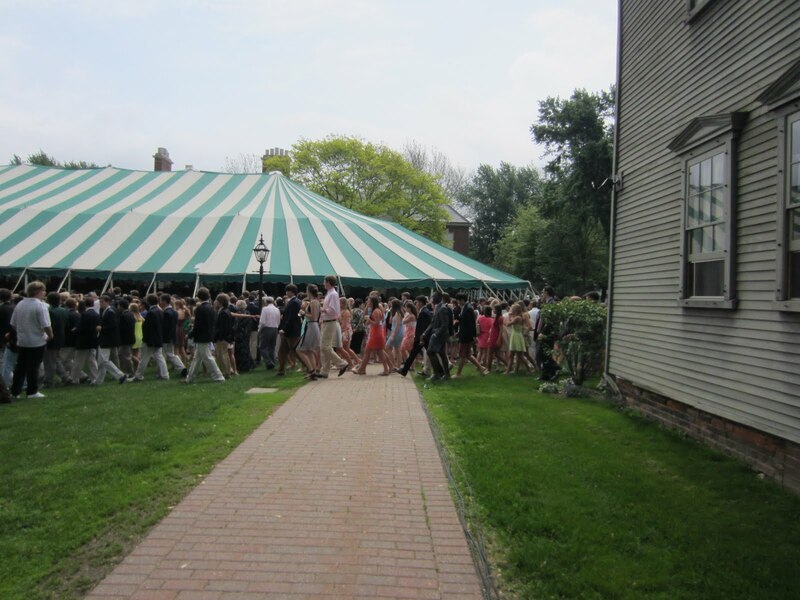 Even former members, who have graduated, regularly check out the chapter website and some even commented on the delicious cuisine that we had at our recent party! The panelists emphasized how much they gained from meeting the outstanding speakers who spoke in our Speaker Series, how serving as officers provided them with leadership experiences that will serve them well in their professional careers, and the friendships that they have made because of the student chapter and activities. You can download the presentation of the panelists here (it is long but your patience will be rewarded). I might also add that the UMass Amherst INFORMS Student Chapter did a magnificent job helping us with our recent conference, by handling the projectors and equipment, putting up signs for the sessions, giving directions, etc. Many of them showed up at 7AM both days of the conference and stayed until past 8PM! Kudos to the students who work so unselfishly for the betterment of their colleagues, the schools that they represent, their university, and even professional organizations! To me, one of the best parts of going to conferences is the ideas that one comes back with. Now that the First Northeast Regional INFORMS Conference has come to an end, there is some time to reflect on the talks. As I wrote in an earlier blogpost, one of the highlights of this conference at UMass Amherst was the caliber of the plenary speakers and their presentations. visualization, since this is such an effective means in which to display scientific results in a graphic and more understandable way to clients, executives, users, etc. including people in the loop. Dr. Alex "Sandy" Pentland, the Director of the Human Dynamics Lab, at the Media Lab at MIT, spoke on Building A Nervous System for Humanity: Making Health, Financial, Logistics, and Transportation Networks Work. He also emphasized how to include people in the loop through the measurement tools that he and his group have developed that were the subject of his brilliant book, Honest Signals. I have an autographed copy, since we hosted Dr. Pentland in our UMass Amherst INFORMS Speaker Series in 2009 and I had the privilege of attending his tutorial at the SBP 2011 conference at the University of Maryland College Park last March. It helped that I was the tutorial chair of that conference. Both Dr. Dietrich and Dr. Pentland spoke on transportation in their plenaries, a subject very dear to me. Dr. David Simchi-Levi had a nice twist to his plenary. The theme of our conference was Theory to Practice and he spoke on Flexibility -- From Practice to Theory. He emphasized how ideas were generated by embedding students for months in corporations to observe operations and noted how one of his students spent over 6 months in a Pepsico plant and this enabled his group to develop theory regarding flexibility, as in the context of multiple plants producing multiple products. The results affected Pepsico's bottom line. It takes a lot of planning and hard work to put on a conference and any successful conference is a major collaborative effort that takes months of preparation and careful attention to detail and logistics. The First Northeast Regional INFORMS Conference, which took place May 6-7, 2011, at UMass Amherst is now over and from all the comments that we have received, it was clearly a success. Below I feature, through photos, some of the highlights of our conference. Special thanks to the institutions that provided financial support, including the Isenberg School and the College of Engineering at UMass Amherst, and to Dr. Hari Balasubramanian of the College of Engineering at UMass Amherst and to Dr. Les Servi of MITRE, for their extraordinary efforts in making this conference a success. It was such a pleasure to work with them. Also, thanks to all those who traveled to our campus and gave such wonderful presentations and engaged everyone in stimulating conversations and discussions. Thanks and applause to Mary Magrogan and Tracy Byrnes of INFORMS for spending several days at UMass Amherst and for doing so much before and doing the conference. I would also like to thank the officers and members of the UMass Amherst INFORMS Student Chapter who helped out with the projectors, the session notices, by giving directions, etc. Plus, many of the members presented their research and some even were panelists! I always enjoy reading the "Room for Debate" in The New York Times, which focuses on experts debating timely topics with comments by readers. The latest "Room for Debate" topic is on the recently released UN report on the world's population projected to increase to 10.1 billion by 2100. Two of those providing commentary are Dr. Joel Cohen of the Rockefeller University and Dr. Brad Allenby of Arizona State University. Interestingly, both have cited my work -- Dr. Cohen in his work on the Braess paradox with Frank Kelly, and Dr. Allenby in his work at the Center for Earth Systems Engineering and Management. In fact, Dr. Allenby, while he was at AT&T, announced my Industrial Ecology Award, which helped to support the founding of the Virtual Center for Supernetworks that I direct. I actuallly received two of these awards, in subsequent years, and enabled some very interesting research on environmental supernetworks and electronic recycling. The First INFORMS Northeast Regional Conference Begins Tomorrow! The First Northeast Regional INFORMS Conference begins tomorrow and takes place at UMass Amherst. The full program and additional information can be found here. The UMass publication, In the Loop, had a nice article on the conference. The conference will begin tomorrow morning at 8:00AM with remarks by Dr. Hari Balasubramanian of the Department of Mechanical and Industrial Engineering at UMass Amherst, who is the Chair of the Conference. Dr. Mark Fuller, the Dean of the Isenberg School of Management, will also make some remarks. Then it will be time for the first of two plenary talks, given by Dr. David Simchi-Levy of MIT. Dr. Alex "Sandy" of the Media Lab at MIT will give his plenary in the afternoon and I will have the pleasure of introducing him. There will be several panels tomorrow. I will be taking part in the research panel in the afternoon with Dr. Mary Helander of IBM, Dr. Les Servi, the conference program co-chair, who is from MITRE, and Dr. Amr El-Bakry of Exxon-Mobil. The UMass Amherst INFORMS Student Chapter is helping out as well so it should be a wonderful experience for our students. And, one of the highlights for me is that I don't even have to pack a suitcase and can sleep in my own bed since the conference is at UMass! The UMass Amherst INFORMS Student Chapter Party Was Wonderful! The semester has ended and the exams are beginning soon. We celebrate the "end of the semester" by hosting a party filled with international cuisine, students, faculty, staff, and great conversation. Today, we had our UMass Amherst INFORMS Student Chapter party at the Isenberg School and I will let the photos above speak for themselves. A great time was had by all and I commend the students for doing so much at this busy time of the year! We also honored our hard-working student chapter officers.